"...The tear-jerking payload hits its target effectively in the second act, which is also where Bashor's affectionate reactivity as Bertie dissolves in the face of mortality. We see a gracious woman who knows that her best friend needs emotional ballast of her own to anchor her through the inevitable losses of life. Like Cee Cee, the creators need to let those naked emotions – that raw human need for stability in a life of cruel uncertainty -- shine through the wisecracks. If they can find that wind earlier in the story, "Beaches" could take wing as a sentimental but effective musical portrait of female friendships." "...The show, which opened Thursday at the Drury Lane Oakbrook Theatre in its “pre-Broadway” edition, features a book co-adapted by Iris Rainier Dart (based on her novel) and Thom Thomas, with music by David Austin and lyrics by Dart. Polished and accomplished, with ideally cast sets of three different actresses playing the child, teenage and adult incarnations of each of the two principal female characters, it captures the changes in American women’s lives from the 1950s through the mid 1980s with considerable subtlety. But there also is something of a paint-by-numbers quality to the whole thing that only relaxes in its very last scenes." "...Like the film, the musical ends with death-which to her credit, Rainer Dart treats with focus, humor, and sincerity. But that doesn't redeem the chaotic first half, and it certainly doesn't save it musically. For now, the wind beneath its wings needs to blow a whole lot harder." "...Once Beaches is tightened and trimmed, it will become a commercial light-weight musical that evolves into a friendship musical with loads of heart. As it now plays, it tries to do too much with some dance numbers and fluff that doesn’t come out of the story. 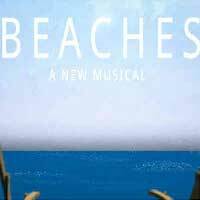 I think Beaches’ book is strong enough that I’d strive for more of a dramatic play with music/songs rather than a pop commercial musical. Trust the story more and cut the fluff and Beaches could be a major hit like Mamma Mia! but with a more powerful story. As it now structured, it is worth a look." "...Brian J. Nash’s musical direction is sharp and his orchestra never misses a beat. The choreography by Lorin Latarro is unique and the wigs (Rick Jarvie) and costumes (Alejo Vietti) along with the lighting by Howell Binkley make the pieces fit. Knowing that this is a new show, with a new script and new music that has a stirring desire to make it to Broadway, I am sure there will be changes on the way. In fact, I would bet that by the time this run ends (August 16th), many alterations and changes will take place. This is all part of what the world of theater is all about, and one of the reasons that live theater is so exciting." "...Eric Schaeffer’s direction is competent and keeps this story moving right along. Brian J. Nash and Alan Bukowiecki conduct the Drury Lane orchestra with assurance, allowing the horns, reeds and percussion to really sell the score. This musical might be a bit more successful if the first act were tightened up a bit, especially before it opens on Broadway. Other than the dynamic opening number and finale of Act I, it’s the final few scenes that leave the biggest impression. All the makings of an excellent show are here, however, and this musical deserves to be seen and heard by area audiences. It’s great to be reminded of what it means to be friends, real friends, forever."